VIRGIL was a Latin poet who flourished in Rome in the C1st B.C. during the reign of the Emperor Augustus. His works include the Aeneid, an twelve book epic describing the founding of Latium by the Trojan hero Aeneas, and two pastoral poems--Eclogues and Georgics. Virgil. Eclogues, Georgics, Aeneid. Translated by Fairclough, H R. Loeb Classical Library Volumes 63 & 64. Cambridge, MA. Harvard University Press. 1916. Revised versions of these two volumes are available new from Amazon.com (click on image right for details). 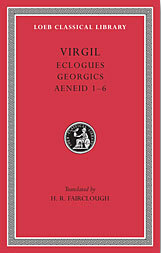 In addition to the translation of Virgil's three poems, the book contains recent text revisions by G. P. Goold, source Latin texts, Fairclough's footnotes and an index of proper names. These, as well as several other more recent translations and academic commentaries, appear in the booklist (below left). What makes the crops joyous, beneath what star, Maecenas, it is well to turn the soil, and wed vines to elms, what tending the cattle need, what care the herd in breeding, what skill the thrifty bees – hence shall I begin my song. O most radiant lights of the firmament, that guide through heaven the gliding year, O Liber and bounteous Ceres, if by your grace Earth changed Chaonia’s acorn for the rich corn ear, and blended draughts of Achelous with the newfound grapes, and you Fauns, the rustics’ ever present gods (come trip it, Fauns, and Dryad maids withal! ), ‘tis of your bounties I sing. And Neptune, for whom Earth, smitten by your mighty trident, first sent forth the neighing steed; you, too, spirit of the groves [Aristaeus], for whom thrice a hundred snowy steers crop Cea’s rich thickets; you too, Pan, guardian of the sheep, leaving your native woods and glades of Lycaeus, as you love your own Maenalus, come of your grace, Tegean lord! Come, Minerva, inventress of the olive; you, too, youth [Triptolemus], who showed to man the crooked plough; and you, Silvanus, with a young uprooted cypress in your hand; and gods and goddesses all, whose love guards our fields – both you who nurse the young fruits, springing up unsown, and you who on the seedlings send down from heaven plenteous rain! And you above all, Caesar, whom we known not what company of the gods shall claim ere long; whether you choose to watch over cities and care for our lands, that so the great globe may receive you as the giver of increase and lord of the seasons, wreathing your brows with your mother’s myrtle; whether you come as god of the boundless sea and sailors worship your deity alone, while farthest Thule owns your lordship and Tethys with the dowry of all her waves buys you to wed her daughter; or whether you add yourself as a new star to the lingering months, where, between the Virgin and the grasping Claws, a space is opening (lo! for you even now the blazing Scorpion draws in his arms, and has left more than a due portion of the heaven!) – whatever you are to be (for Tartarus hopes not for you as king, and may such monstrous lust of empire never seize you, though Greece is enchanted by the Elysian fields, and Proserpine reclaimed cares not to follow her mother), grant me a calm voyage, give assent to my bold emprise, and pitying with me the rustics who know not their way, enter upon your kingdom, and learn even now to hearken to our prayers! In the dawning spring, when icy streams trickle from snowy mountains, and the crumbling clod breaks at the Zephyr’s touch, even then would I have my bull groan over the deep-driven plough, and the share glisten when rubbed by the furrow. That field only answers the covetous farmer’s prayer which twice has felt the sun and twice the frost; from it boundless harvests burst the granaries. And ere our iron cleaves an unknown plain, be it first our care to learn the winds and the wavering moods of the sky, the wonted tillage and nature of the ground, what each clime yields and what each disowns. Here corn, there grapes spring more luxuriantly; elsewhere young trees shoot up, and grasses unbidden. See you not, how Tmolus sends us saffron fragrance, India her ivory, the soft Sabaeans their frankincense; but the naked Chalybes give us iron, Pontus the strong-smelling beaver’s oil, and Epirus the Olympian victories of her mares? From the first, Nature laid these laws and eternal covenants on certain lands, even from the day when Deucalion threw stones into the empty world, whence sprang men, a stony race. Come then, and where the earth’s soil is rich, let your stout oxen upturn it straightway, in the year’s first months, and let the clods lie for dusty summer to bake with her ripening suns; but should the land not be fruitful, it will suffice, on the eve of Arcturus’ rising, to raise it lightly with shallow furrow – in the one case, that weeds may not choke the gladsome corn; in the other, that the scant moisture may not desert the barren sand. In alternate seasons you will also let your fields lie fallow after reaping, and the plain idly stiffen with scurf; or, beneath another star, sow yellow corn in lands whence you have first carried off the pulse that rejoices in its quivering pods, or the fruits of the slender vetch, or the brittle stalks and rattling tangle of the bitter lupine. For a crop of flax parches the ground; oats parch it, and poppies, steeped in Lethe’s slumber. Yet by changing crops the toil is light; only be not ashamed to feed fat the dried-out soil with rich dung, and to scatter grimy ashes over the exhausted fields. Thus also, with change of crop, the land finds rest, and meanwhile not thankless in the unploughed earth. Often, too, it has been useful to fire barren fields, and burn the light stubble in crackling flames; whether it be that the earth derives thence hidden strength and rich nutriment, or that in the flame every taint is baked out and the useless moisture sweats from it, or that that heat opens fresh paths and loosens hidden pores, by which the sap may reach the tender blades, or that it rather hardens the soil and narrows the gaping veins, that so the searching showers may not harm, or the blazing sun’s fierce tyranny wither it, or the North Wind’s piercing cold. Much service does he do the land who with the mattock breaks up the sluggish clods, and drags over it hurdles of osier; nor is it without reward that golden Ceres looks on him from Olympian heights. Much service, too does he who turns his plough and again breaks crosswise through the ridges which he raised when first he cut the plain, ever at his post to discipline the ground, and give his orders to the fields. For moist summers and sunny winters, pray, farmers! With winter’s dust most gladsome is the corn, gladsome is the field: under no tillage does Mysia so glory, and then even Gargarus marvels at his own harvests. Need I tell of him who flings the seed, then, hoe in hand, closes with the soil, and levels the hillocks of barren sand; then brings to his crops the rills of the stream he guides, and when the scorches land swelters, the green blades dying, lo, from the brow of the channeled slope decoys the water? Down it falls, and waking a hoarse murmur amid the smooth stones, slakes the thirsty soil with its gushing stream. Need I tell of him who, lest the stalk droop with overweighted ears, grazes down his luxuriant crop in the young blade as soon as the growing corn is even with the furrow’s top, or of him who draws off a marsh’s gathered moisture with absorbent sand – chiefly when, in treacherous months, a river at the full overlflows, and far and wide cloaks all in mud, till the hollow ditches steam with warm vapour? Nor yet, after all that the toil of man and beast has achieved in oft turning the land, does the rascally goose do no mischief, or the Strymonian cranes, or the bitter fibres of chicory; nor is the shade of trees harmless. The great Father himself has willed that the path of husbandry should not run smooth, who first made art awake the fields, sharpening men’s wits by care, nor letting his kingdom slumber in heavy lethargy. Before the reign of Jove no tillers subjucated the land: even to mark possession of the plain or apportion it by boundaries was sacrilege; man made gain for the common good, and Earth of her own accord gave her gifts all the more freely when none demanded them. Jove it was who put the noxious venom into deadly snakes, who bade the wolf turn robber and the ocean swell with tempest, who stripped honey from the leaves, hid fire from view, and stayed the wine that once ran everywhere in streams, so that experience, from taking thought, might little by little forge all manner of skills, seeking in ploughed furrows the blade of corn, striking forth the spark hidden in the veins of flint. Then first did rivers feel upon their backs boats of hollowed alder, then the mariner grouped and named the stars, Pleiads and Hyads and Lycaon’s daughter, the radiant Bear. Then was discovered how to catch game with traps, snare birds with lime, and how to encircle vase coverts with hunting dogs. Already one man is lashing a broad stream with his casting net, seeking the bottom, while another trawls through the sea his dripping meshes. Then came unyielding iron and the blade o the rasping saw (for primitive man used wedges to cleave wood until it split), and art followed hard on art. Toil triumphed over every obstacle, unrelenting Toil, and Want that pinches when life is hard. Ceres was the first to teach men to turn the earth with iron, when the acorns and the arbutes of the sacred wood began to fail, and Dodona withheld her food. Soon, too, on the corn fell trouble, the baneful mildew feeding on the stems, and the lazy thistle bristling in the fields; the crops die, and instead springs up a prickly growth of burs and caltrops, and amid the smiling corn luckless darnel and barren oats hold sway. Therefore, unless your hoe is ever ready to assail the weeds, your voice to terrify the birds, your knife to check the shade over the darkened land, and your prayers to invoke the rain, in vain, poor man, you will gaze on your neighbour’s large store of grain, and you will be shaking oaks in the woods to assuage your hunger. I must tell, too, of the hardy farmers’ weapons, without which the crops could be neither sown nor raised. First the share and the curved plough’s heavy frame, the slow-rolling wains of the Mother of Eleusis, sledges and drags, and hoes of cruel weight; further, the common wicker ware of Celeus, arbute hurdles and the mystic fan of Iacchus. All of these you will remember to provide and store away long beforehand, if the glory the divine country gives is to be yours in worthy measure. From the first, even in the woods, an elm, bent by main force, is trained for the stock, and receives the form of the crooked plough. To the temp of this is fitted a pole, eight feet in length, with two mould boards, and a share beam with double back. A light linden, too, is felled beforehand for the yoke, and a tall beech for the handle, to turn the car below from the rear; and the wood is hung above the hearth for the smoke to season. I can repeat for you many olden maxims, unless you shrink back and are loath to learn such trivial cares. And chiefly, the threshing floor must be leveled with a heavy roller, kneaded with the hand, and made solid with binding clay, lest weeds spring up, or, crumbling into dust, it gape open, and then divers plagues make mock of you. Often under the ground the tiny mouse sets up a home and builds his storehouses, or sightless moles dig out chambers; in holes may be found the toad, and all the countless pests born of the earth; or the weevil ravages a huge heap of grain, or the ant, fearful of a destitute old age. Mark, too, when in the woods the walnut clothes itself thickly in blossom and bends its fragrant boughs: if the fruit prevails, the corn crops will keep pace with it, and a great threshing come with a great heat; but if the shade is abundant in the fullness of leafage, in vain shall your floor thresh stalks, rich only in chaff. Many a sower have I seen treat his seeds, drenching them first with nitre and black oil lees, that the deceitful pods might yield larger produce, and the grains be sodden quickly, however small the fire. I have seen seeds, though picked long and tested with much pains, yet degenerate, if human toil, year after year, culled not the largest by hand. Thus by law of fate all things speed towards the worse and slipping away fall back even as if one, whose oars can scarce force his skiff against the stream, should be chance slacken his arms, and lo! headlong down the current the channel sweeps it away. Furthermore, we must watch the star of Arcturus, the days of the Kids, and the gleaming Snake, even as they do who, sailing homeward over windswept seas, brave the Pontus and the jaws of oyster-breeding Abydus. When the Balance makes the hours of daytime and sleep equal, and now parts the world in twain; half in light and half in shade, then, my men, work your oxen, sow barley in your fields, as late as the eve of winter’s rains, when work must cease. Then, too, is the time to hide in the ground your crop of flax and the poppy of Ceres; and high time is it to bend to the plough, while the dry soil will let you and the clouds are still aloft. Spring is the sowing time for beans; then, too, the crumbling furrows welcome you, Median clover, and the millet claims our yearly care, when the snow-white Bull with gilded horns ushers in the year, and the Dog sets, retiring before the Bull’s confronting star. But if for harvest of wheat and for hardy spelt you ply the ground, and if grain alone is your aim, first let the daughters of Atlas pass from your sight in the morn, and let the Cretan star of the blazing Crown withdraw ere you commit to the furrows the seeds due, or hasten to trust the year’s hope to a reluctant soil. Many have begun ere Maia’s setting, but the looked-for crop has mocked them with empty straws. Yet if you choose to sow the vetch or homely kidney bean, and scorn not the care of Egyptian lentil, setting Boötes will send you no doubtful signs. Begin, and carry on your sowing to midwinter’s frosts. To this end the golden Sun rules his circuit, portioned out in fixed divisions, through the world’s twelve constellations. Five zones comprise the heavens; whereof one is ever glowing with the flashing sun, ever scorched by his flames. Round this, at the world’s ends, two stretch darling to right and left, set fast in ice and black storms. Between these and the idle zone, two by grace of the gods have been vouchsafed to feeble mortals; and a path is cut between the two, wherein the slanting array of the Signs may turn. As our globe rises steep to Scythia and the Riphaean crags, so its slopes downward to Libya’s southland. One pole is ever high above us, while the other, beneath our feet, is seen of black Styx and shades infernal. Here, with his tortuous coils, the mighty Snake glides forth, river-like, about and between the two Bears – the Bears that shrink from the plunge beneath Ocean’s plain. There, men say, is either the silence of lifeless night, and gloom ever thickening beneath night’s pall; or else Dawn returns from us and brings them back the day, and when on us the rising Sun first breathes with panting steeds, there glowing Vesper is kindling his evening rays. Hence, though the sky be fitful, we can foretell the weather’s changes, hence the harvest tide and sowing time; when it is meet to lash with oars the sea’s faithless calm, when to launch our well-rigged fleet, or in the woods to fell the pine in season. Not in vain do we watch the signs, as they rise and set, and the year, uniform in its four several seasons. Whenever a cold shower keeps the farmer indoors, he can prepare at leisure much that ere long in clear weather must needs be hurried. The ploughman hammers out the hard tooth of the blunted share, scoops troughs from trees, or sets a brand upon his flocks and labels upon his corn heaps. Others sharpen stakes and two-pronged forks, or make bands of Amerian willows for the limber vine. Now let the pliant basket be woven of briar twigs, now roast corn by the fire, now grind it on the stone. Even on holy days, the laws of God and man permit you to do certain tasks. No scruples ever forbade us to guide down the rills, to defend a crop with a hedge, to set snares for birds, to fire brambles, or to plunge bleating flocks into the health-giving stream. Oft, too, the driver loads his slow donkey’s sides with oil or cheap fruits, and as he comes back from town brings with him an indented millstone or a mass of black pitch. The Moon herself has ordained various days in various grades as lucky for work. Shun the fifth; then pale Orcus and the Furies were born; then in monstrous labour Earth bore Coeus, and Iapetus and fierce Typhoeus, and the brethren who were banded to break down Heaven. Thrice did they essay to pile Ossa on Pelion, and over Ossa to roll leafy Olympus; thrice, with his bolt, the Father dashed apart their up-piled mountains. The seventeenth is lucky for planting the vine, for yoking and breaking in oxen, and for adding the leashes to the warp. The ninth is a friend to the runaway, a foe to the thief. There are many things, too, that make better progress in the cool of night, or when at early sunrise the day star bedews the earth. At night the light stubble is best shorn, at night the thirsty meadows; at night the softening moisture fails not. One I know spends wakeful hours by the late blaze of a winter fire, and with sharp knife points torches; his wife the while solaces with song her long toil, runs the shrill shuttle through the web, or on the fire boils down the sweet juice of must, and skims with leaves the froth of the bubbling cauldron. But Ceres’ golden grain is cut down in noonday heat, and in noonday heat the floor threshes the parched ears. Strip to plough, strip to sow; winter is the farmer’s lazy time. In cold weather farmers chiefly enjoy their gains, and feast together in merry companies. Winter’s cheer calls them, and loosens the weight of care – even as when laden keels have at last reaches port, and the merry sailors have crowned the poops with garlands. Still, then is the time to strip the acorns and laurel berries, the olive and blood-red myrtle; the time to set snares for cranes and nets for the stag, and to chase the long-eared hares; the time to smite the does, as you whirl the hempen thongs of a Balearic sling – when the snow lies deep, when the rivers roll down the ice. Why need I tell of autumn’s changes and stars, and for what our workers must watch, as the day now grows shorter and summer softer, or when spring pours down in showers, as the bearded harvest now bristles in the fields, and the corn on its green stem swells with milk? Often when the farmer was bringing the reaper into his golden fields and was just beginning to strip the barley from the frail stalk, I have seen all the winds close in conflict, tearing up the heavy corn far and wide from its deepest roots and tossing it on high; so in a black whirlwind did the storm sweep away the light straw and flying stubble. Often, too, there appears in the sky a mighty column of waters, and clouds mustered from on high roll up a murky tempest of black showers: down falls the lofty heaven, and with its deluge of rain washes away the gladsome crops and the labours of oxen. The dykes fill, the deep-channelled rivers swell and roar, and the sea steams in its heaving friths. The Father himself, in midnight of storm clouds, wields his bolts with flashing hand. At that shock the mighty earth shivers; far flee the beasts and all over the world prostrating terror lays low men’s hearts; he with blazing bolt dashes down Athos or Rhodope or the Ceraunian peaks. The winds redouble; more and more thickens the rain; now woods, now shores wail with the mighty blast. In fear of this, mark the months and signs of heaven; whither Saturn’s cold star withdraws itself and into what circles of the sky strays the Cyllenian fire. Above all, worship the gods, and pay great Ceres her yearly rites, sacrificing on the glad sward, with the setting of winter’s last days, when clear springtime is now come. Then lambs are fat and wine is most mellow; then sweet is sleep, and thick are the shadows on the hills. Then let all your country folk worship Ceres; for her wash the honeycomb with milk and soft wine, and three time let the luck-bringing victim pass round the young crops, while the whole choir of your comrades follow exulting, and loudly call Ceres into their homes; nor let any put his sickle to the ripe corn, ere for Ceres he crown his brows with oaken wreath, dance artless measures, and chant her hymns. And that through unfailing signs we might learn these dangers – the heat, and the rain, and the cold-bringing winds – the Father himself decreed what warning the monthly moon should give, what should signal the fall of the wind, and what sight, oft seen, should prompt the farmer to keep his cattle nearer to their stalls. From the first, when the winds are rising, either the sea’s straits begin to heave and swell, and on mountain heights is heard a dry crash, or the shores ring a confused echo afar and the woodland murmur waxes loud. Then, too the wave scarce keeps itself from the curved keel, when the fleet gulls fly back from mid-ocean, wafting their screams shoreward, and when the sea coots sport on dry land, and the heron quits its home in the marsh and soars aloft above the clouds. Often, too, when wind is threatening, you will see stars shoot headlong from the sky and behind them long trails of flame, gleaming white amid night’s blackness; often light chaff and falling leaves fly about and feathers dance as they float on the water’s top. But when it lightens from the region of the grim North, and when the home of the East and West winds thunders, then the ditches overflow and all the fields are flooded, while on the deep every mariner furls his dripping sails. Never has rain brought ill to men unwarned. Either, as it gathers, the sky cranes flee before it in the valley’s depths; or the heifer looks up to heaven, and with open nostrils snuffs the breeze, or the twittering swallow flits round the pools, and in the mud the frogs croak their immemorial plaint. Often, too, the ant, wearing her narrow path, brings out her eggs from her inmost cells and a great rainbow drinks, and an army of rooks, quitting their pasture in long array, clang with series wings. Again, you may see the manifold birds of the sea, and such as, in Cayster’s sweet pools, rummage round the Asian meadows, now rivaling each other in pouring the copious spray over their shoulders, now dashing their heads in the waves, now running into the waters, and aimlessly exulting in the joy of the bath. Then the villainous raven with deep tones calls down the rain, and in solitary state stalks along the dry sea sand. Even at night, maidens that spin their tasks have not failed to mark a storm as they saw the oil sputter in the blazing lamp, and a mouldy fungus gather on the wick. Nor less after rain may you foresee bright suns and cloudless skies, and know them by sure signs. For then the stars’ bright edge is seen undimmed, and the moon rises under no dept to her brothers’ rays, and no thin fleecy clouds pass over the sky. Not now do the halcyons, the pride of Thetis, spread their wings on the shore to catch the warm sun, nor do the uncleanly swine think of tossing straw bundles to pieces with their snouts. But the mists are prone to seek the valleys, and rest on the plain, and the owl, as she watches the sunset from some high peak, vainly plies her evening song. Nisus is seen aloft in the clear sky, and Scylla suffers for the crimson lock. Wherever she flees, cleaving the light air with her wings, lo! savage and ruthless, with loud whirr Nisus follows through the sky; where Nisus mounts skyward, she flees in haste, cleaving the light air with her wings. Then the rooks, with narrowed throat, thrice or four times repeat their soft cries, and oft in their high nests, joyous with some strange, unwonted delight, chatter to each other amid the leaves. Glad are they, they rains over, to see once more their little brood and their sweet nests. Not, methinks, that they have wisdom from on high, or from Fate a larger foreknowledge of things to be; but that when the weather and fitful vapours of the sky have turned their course, and Jove, wet with south winds, thickens what just now as rare, and makes rare what now as thick, the phase of their minds change, and their breasts now conceive impulses, other than they felt when the wind was chasing the clouds. Hence that chorus of the birds in the fields, the gladness of the cattle, and the exulting cries of the rocks. But if you pay heed to the swift sun and the moons, as they follow in order, never will tomorrow’s hour cheat you, nor will you be ensnared by a cloudless night. Soon as the moon gathers her returning fires, if she encloses a dark mist within dim horns, a heavy rain is awaiting farmers and seamen. But if over her face she spreads a maiden blush, there will be wind; as wind rises, golden Phoebe ever blushes. But if at her fourth rising – for that is our surest guide – she pass through the sky clear and with undimmed horns, then all that day, and the days born of it to the month’s end, shall be free from rain and wind; and the sailors, safe in port, shall pay their vows on the shore to Glaucus, and to Panopea, and to Melicerta, Ino’s son. The sun, too, alike when rising and when sinking under the waves, will give tokens: tokens most sure will attend the sun, both those he brings each dawn and those he shows as the stars arise. When, hidden in cloud, he has chequered with spots his early dawn, and is shrunk back in the centre of his disc, beware of showers; for from the deep the South Wind is sweeping, foe to tree and crop and herd. Or when at dawn scattered shafts break out amid thick clouds, or when Aurora rises pale, as she leaves Tithonus’ saffron couch, ah! Poorly then will the vine leaf guard the ripe grapes, so thick the bristling hail dances rattling on the roofs. This, too, when he has traversed the sky and now is setting, it will profit you more to bear in mind; for often we see fitful hues flit over his face: a dark hue threatens rain, a fiery hue, east winds; but if the spots begin to mingle with glowing fire, then shall you see all nature rioting with wind and storm clouds alike. On such a night let none urge me to travel on the deep, or pluck my cable from the land. Yet if, both when he brings back the day, and when he closes the day he brought, his disc is bright, then vain will be your fear of storm clouds, and you will see the woods sway in the clear north wind. In short, the message of late evening, the quarter whence the wind drives clear the clouds, the purpose of the rainy South – of all the Sun will give you signs. Who dare say the Sun is false? He and no other warns us when dark uprisings threaten, when treachery and hidden wars are gathering strength. He and no other was moved to pity Rome on the day that Caesar died, when he veiled his radiance in gloom and darkness, and a godless age feared everlasting night. Yet in this hour Earth also and the plains of Ocean, ill-boding dogs and birds that spell mischief, sent signs which heralded disaster. How oft before our eyes did Etna deluge the fields of the Cyclopes with a torrent from her burst furnaces, hurling thereon balls of fire and molten rocks. Germany heard the noise of battle sweep across the sky and, even without precedent, the Alps rocked with earthquakes. A voice boomed through the silent groves for all to hear, a deafening voice, and phantoms of unearthly pallor were seen in the falling darkness. Horror beyond words, beasts uttered human speech; rivers stood still, the earth gaped upon; in the temples ivory images wept for grief, and beads of sweat covered bronze statues. King of waterways, the Po swept forests along in the swirl of his frenzied current, carrying with him over the plain cattle and stalls alike. Nor in that same hour did sinister filaments cease to appear in ominous entrails or blood to flow from wells or our hillside towns to echo all night with the howl of wolves. Never fell more lightning from a cloudless sky; never was comet’s alarming glare so often seen. So it was that Philippi beheld for a second time Roman armies clash in the shock of matching arms; and Heaven above did not demur at Macedon and the broad Balkan plains being twice glutted with the blood of our fellow citizens. Yes, and a time will come when in those lands the farmer, as he cleaves the soil with his curved plough, will find javelins corroded with rusty mould, or with his heavy hoe will strike empty helmets, and marvel at gigantic bones in the upturned graves. Gods of my country, Heroes of the land, you, Romulus, and you, mother Vesta, who guard the Tuscan Tiber and the Palatine of Rome, at least do not prevent this young prince from succouring a world in ruins! Long enough has our life-blood paid for Laomedon’s perjury at Troy; long enough have Heaven’s courts grudged you, Caesar, to us, complaining that you care for earthly triumphs! For here are right and wrong inverted; so many wars overrun the world, sin walks in so many shapes; respect for the plough is gone; our lands, robbed of the tillers, lie waste, and curved pruning hooks are forged into straight blades. Here Euphrates, there Germany, calls to arms; breaking the covenants which bind them, neighbouring cities draw the sword; the god of unholy strife rages throughout the world, even as when from the starting gates the chariots stream forth and gather speed lap by lap, while the driver, tugging vainly at the reins, is carried along by his steeds, and the car heeds not the curb! Thus far the tillage of the fields and the stars of heaven: now you, Bacchus, will I sing, and with you the forest saplings, and the offspring of the slow-growing olive. Hither Lenaean sire! Here all is full of your bounties; for you blossoms the field teeming with the harvest of the vine, and the vintage foams in the brimming vats. Come hither, Lenaean sire, strip off your buskins and with me plunge your naked legs in the new must. Firstly, Nature has manifold ways for rearing trees. For some, under no man’s constraint, spring up of their own free will, and far and wide claim the plains and winding rivers; such as the limber osier and lithe broom, the poplar, and the pale willow beds with silvery leafage. But some spring from fallen seed, as tall chestnuts, and the mast tree, monarch of the woodland, that spreads its shade for Jove, and the oaks, deemed by the Greeks oracular. With others a dense undergrowth sprouts from the parent root, as with cherries and elms; the laurel of Parnassus, too, springs up, a tiny plant, beneath its mother’s mighty shade. These are the modes Nature first ordained; these give verdure to every kind of forest trees and shrubs and sacred groves. Others there are which Experience has in her course discovered for herself. One man tears away suckers from the mother’s tender frame, and sets them in furrows; another buries in the ground stems, both as cross-cleft shafts and as sharp-pointed stakes. Some trees await the arches of the bent layer, and slips set while yet quick in their own soil; others need no root, and the pruner fears not to take the topmost spray and again entrust it to the earth. When the trunks are cleft – how wondrous the tale! – an olive root thrusts itself from the dry wood. Often, too, we see one tree’s branches turn harmless into another’s, the pear transformed bearing engrafted apples, and stony cornels blushing on the plum. Up, therefore, husbandmen, learn the culture proper to each after its kind; your wild fruits tame by tillage, and let not your soil lie idle. What joy to plant all Ismarus with the vine, and clothe great Taburnus with the olive! And you, Maecenas, my pride, my justest title to fame, come and traverse with me the oilsome course I have essayed, and spread your sails to speed over an open sea. Not mine the wish to embrace all the theme within my verse, not though I had a hundred tongues, a hundred mouths, and a voice of iron! Draw night, and skirt the near shoreline – the land is close at hand. Not here will I detain you with songs of fancy, amid rambling paths and lengthy preludes. Trees that of free will lift themselves into realms of light spring up unfruitful, but rejoicing in their strength, for within the soil is native force. Yet even these, if one graft them, or transplant and commit to well-worked trenches, will doff their wild spirit, and under constant tillage will readily follow any lessons you would have them learn. So, too, the sucker, which springs barren from the bottom of the stem, would do likewise, if set out amid open fields: as it is, the mother tree’s branches and deep leafage overshadow it, robbing it of fruit as it grows, and blasting it in the bearing. Again, the tree which rears itself from chance-dropped seeds rises slowly and will yield its shade to our children of later days; its fruits, too, degenerate, forgetting their olden flavour, and the vine bears sorry clusters, for the birds to pillage. On all, be sure, must labour be spent; all must be marshaled into trenches, and tamed with much trouble. But olives answer best from truncheons, vines from layers, Paphian myrtles from the solid stem. From suckers spring sturdy hazels, and the giant ash, the shady tree that crowned Hercules, and the acorns of the Chaonian sire. So, too, rises the lofty palm, and the fir that will see the perils of the deep. But the rough arbutus is grafted with a walnut shoot, and barren planes have oft borne hardy apple boughs; the beech has grown white with the chestnut’s snowy bloom, the ash with the pear’s; and swine have crunched acorns beneath the elm. Nor is the mode of grafting and of budding the same. For where the buds push out from amid the bark, and burst their tender sheaths, a narrow slit is made just in the knot; in this from an alien tree they insert a bud, and teach it to grow in the sappy bark. Or, again, knotless boles are cut open, and with wedges a path is cleft deep into the core; then fruitful slips are let in, and in a little while, lo! a mighty tree shots up skyward with joyous boughs, and marvels at its strange leafage and fruits not its own. Further, not single in kind are sturdy elms, or the willow, or the lotus, or the cypresses of Ida, nor do rich olives grow to one mould – the orchad and radius, and the pausian with its bitter berry. So, too, with apples and the gardens of Alcinous; nor are cuttings the same for Crustumian and Syrian pears, and the heavy volema. On our trees hangs not the same vintage as Lesbos gathers from Methymna’s boughs: there are Thasian vines, there are the pale Mareotic – these suited for rich coils, those for lighter ones – the Psithian, too, better for raisin wine, and the subtle Lagean, sure some day to trouble the feet and tie the tongue; the Purple and the Precian and you, Rhaetic – how can I do you justice? Yet even so, seek not to rival Falernian cellars! There are, too, Aminnean vines, soundest of wines, to which the Tmolian and the royal Phanaean itself pay homage and the lesser Argitis, which none may match, either in richness of stream or in lasting through many years. Nor would I pass by you, vine of Rhodes, welcome to the gods and the banquet’s second course, and you, Bumastus, with your swelling clusters. But for the many kinds, or the names they bear, there is no numbering – nor, indeed, is the numbering worth the pains. He who would have knowledge of this would likewise want to learn how many grains of sand on the Libyan plain are stirred by the West Wind, or when the East falls in unwonted fury on the ships, would want to know how many billows of the Ionian sea roll shoreward. Nor yet can all soils bear all fruits. In rivers grow willows, in rank fens alders, on rocky hills the barren ash. The shores rejoice most in myrtle groves. Lastly, Bacchus loves open hills, and the yew tree the cold of the North Wind. See, too, earth’s farthest bounds, conquered by tillage – the Arabs’ eastern homes, and the painted Gelonians: trees have their allotted climes. India alone bears black ebony; to the Sabaeans alone belongs the frankincense bough. Why should I tell you of the balsams that drip from the fragrant wood, or of the pods of the ever blooming acanthus? Why tell of the Ethiopian groves, all white with downy wool, or how the Seres comb from leaves their fine fleeces? Or, nearer the Ocean, of the jungles which India rears, that nook at the world’s end where no arrows can surmount the air at the treetop? And yet not slow is that race in handling the quiver. Media bears the tart juices and lingering flavour of the health-giving citron tree, which if cruel stepdames have ever drugged the cups mixing herbs and baleful spells, comes as help most potent, and from the limbs drives the deadly venom. The tree itself is large, and in looks very like a bay; and a bay it were, did it not fling abroad another scent. In now winds fall its leaves; its blossom clings most firmly; with it the Mede treats his mouth’s noisome breath, and curse the asthma of the old. But neither Media’s groves, land of wondrous wealth, nor beauteous Ganges, nor Hermus, whose mud is gold, may rival the glories of Italy – not Bactra nor India, no, not all Araby, though its very sand be incense. Never was our country ploughed by fire-snorting bulls for the sowing of the grisly dragon’s teeth; nor have its fields bristled with the helms and serried lances of warriors. But the land was filled with teeming crops and Bacchus’ Massic juice; it is the home of the olive, the home of fattened flocks. Hence comes the war horse which proudly prances over the plain, hence the milk-white herds of the Clitumnus, and the bull, noblest of victims, which, bathed often in its sacred stream, have escorted Roman triumphs to their shrines of the gods. Here spring is perpetual, and summer extends to months other than her own; twice a year the cows calve, twice a year the trees serve us fruit. Here are no ravening tigers or savage brood of lion; no aconite deceives the wretch who picks it, nor yet, sweeping huge coils along the ground, does the scaly snake with his vast train wind himself into a spiral. Count, too, those many stately cities, monument to human toil, and all the towns built by man’s hand on rocky crags with rivers gliding beneath their immemorial walls. Shall I tell of the sea that washes Italy’s shores above and that which breaks on her coasts below? Or tell of her mighty lakes? Of you, Larius, the greatest, or you, Benacus, who swell with a sea’s surge and roar? Shall I tell of her harbours, and the barrier thrown across the Lucrine, and how Ocean clamours aloud in anger, where the Julian waters echo afar as the sea is flung back, and the Tyrrhenian tide pours into the channels of Avernus? This land has also streams of silver and mines of copper to show in her veins, and gold flows profusely in her rivers. She has mothered a vigorous breed of men, Marsians and the Sabine stock, the Ligurian, unured to hardship, and the Volscian spearmen; the Decii, the Marii, the great Camilli, the Scipios, hardy warriors, and you, greatest of all, Caesar, who, already victorious in Asia’s farthest bounds, now drive the craven Indian from our hills of Rome. Hail, land of Saturn, mighty mother of crops, mighty mother of men! For you I attempt a theme that claimed praise and skill in days of old; for you I dare to unseal the sacred springs and through Roman towns to sing the song of Ascra. Now give we place to the genius of soils, the strength of each, its hue, its native power for bearing. Firs then, churlish ground and unkindly hills, where there is lean clay, and gravel in the thorny fields, delight in Minerva’s grove of the long-lived olive. A token of this is the oleaster, springing up freely in the same space, and the ground strewn with its wild berries. But a rich soil, which rejoices in sweet moisture, a level space thick with herbage and prolific in nutriment (such as we often see in the hollow of a mountain valley, for into it from the rocky heights pour the streams, bearing with them fattening mud), land which rises to the south and feeds the fern, that plague of the crooked plough – this land will some day yield you the hardiest of vines, streaming with the rich flood of Bacchus; this is fruitful in the grape, and in the juice we offer from bowls of fold, when the sleek Etruscan has blown his ivory horn beside the altar, and on bellied platters we present the steaming meat of sacrifice. But if your business is rather the keeping of herds and calves, or breeding sheep, or goats that blight the plants, then haste to the glades and distant meads of rich Tarentum, or to such a plain as unhappy Mantua lost, giving good to snowy swans with its grassy stream. There the flocks will lack nor limpid springs nor herbage, and all that the herds will crop in the long days the chilly dew will restore in one short night. Land that is black, and rich beneath the share’s pressure and with a crumbly soil – for such a soil we try to rival with our ploughing – is, in the main, best for corn; from no other land will you see more wagons wending homeward behind slow bullocks, or land from which the angry ploughman has carried off the timber, leveling groves that have idled many a year, and tearing up by their deepest roots the olden homes of the birds – these leave their nests and seek and the sky, but forthwith the untried plain glistens under the driven ploughshare. For as to the hungry gravel of a hilly country, it scarce serves the bees with lowly spurge and rosemary; and the rough tufa and the chalk that black water snakes have eaten out betoken that no other lands give serpents food so sweet, or furnish such winding coverts. But if a soil exhales thin mists and curling vapours, if it drinks in moisture and throws it off again at will, if it always clothes itself in the verdure of its own grass, and harms not the steel with scurf and salt rust, that is the one to wreathe your elms in joyous vines, the one to be rich in oil of olive, the one you will find, as you till, to be indulgent to cattle and submissive to the crooked share. Such is the soil rich Capua ploughs, and the coast near the Vesuvian ridge, and Clanius, unkindly to forlorn Acerrae. Now I will tell you how you may distinguish each. If you shall ask whether a soil be light or closer than is the wont – for one is friendly to corn, the other to the vine; the closer to Ceres, all the lightest to Lyaeus – you must first look out a place and bid a pit be sunk deep in the solid ground, then put all the earth back again, and tread the earth level at the top. If it fall short, this farm land will be light, and better suited for the herd and gracious vine; but if it shows that it cannot return to its place, and if there is earth to spare when the pit is filled, the soil is stiff: look for reluctant clods and stiffness of ridge, and have strong oxen break your ground. As for salty land, the kind called bitter (unfruitful it is for the crops and mellows not in ploughing; it preserves not for the vine its lineage, or for apples their fame), it will allow this test: pull down from the smoky roof your close-woven wicker baskets and wine strainers: in these let that sorry soil, mixed with fresh spring water, be pressed in to the brim. You will see all the water trickle through the big drops pass between the osiers; but the taste will tell its tale full plainly, and with its bitter flavour will distort the testers’ soured mouths. Again, richness of soil we learn in this way only: never does it crumble when worked in the hands, but like pitch grows sticky in the fingers when held. A most soil rears taller grass and is of itself unduly prolific. Ah! Not mine be that over-fruitful soil, and may it not show itself too strong when the ears are young! A heavy soil betrays itself silently by its own weight; so dies a light one. It is easy for the eye to learn at once a black soil and the hue of any kind. But to detect the villainous cold is hard; only pitch pines or baleful yews and black ivy sometimes reveal its traces. These points observed, remember first to bake the ground well, to cut up the huge knolls with trenches, and to expose the upturned clods to the North wind, long before you plant the vine’s gladsome stock. Fields of crumbing soil are the best; to this the winds see, the chill frosts, and the stout delver, who loosens and stirs the acres. But men whose watchful care nothing escapes first seek out like plots – one where the crop may be nursed in infancy for its supporting trees, and one to which it may be moved anon when planted out, lest the nurslings should fail to recognize the mother suddenly changed. Nay, the print on the bark of the trees the quarter of the sky each faced, so as to restore the position in which they stood, the same side bearing the southern heat and the same back turned to the north pole; so strong is habit in tender years. First inquire whether it be better to plant the vine on hills or on the plain. If it is rich level ground you lay out, plant close; in close-planted soil not less fertile is the wine god. But if it is a soil of rising mounds and sloping hills, give the ranks room; yet none the less, when the trees are set, let all the paths, with clear-cut line, square to a nicety. As oft, in mighty warfare, when the legion deploys its companies in long array and the column halts on the open plain, when the lines are drawn out, and far and wide all the land ripples with the gleam of steel, not yet is the grim conflict joined, but the war god wanders in doubt between the hosts; so let all your vineyard be meted out in even and uniform paths, not merely that the view may fed an idle fancy, but because only thus will the earth give equal strength to all, and the boughs be able to reach forth into free air. Perchance you ask also what should be the trenches’ depth. I should venture to entrust a vine even to a shallow furrow, but deeper and far within the earth is sunk the supporting tree, above all the great oak, which strikes its roots down towards the nether pit as far as it lifts its top to the airs of heaven. Hence no winter storms, no blasts or rains, uproot it; unmoved it abides, and many generations, many ages of men it outlives, letting them roll by while it endures. Stout limbs, too, and arms it stretches far, this side and that, itself in the centre upholding a mass of shade. Let not your vineyards slope towards the setting sun, nor plant the hazel among the vines, nor lop the highest sprays, nor pluck cuttings from the treetop – so strong is their love of the earth – nor hurt young plants with a blunted knife, nor engraft wild trunks of olive. For oft from thoughtless shepherds falls a spark, which lurking at first unseen under the rich bark, fastens on the trunk, and, gliding to the leaves aloft, sends to heaven a mighty roar; then, running on, reigns supreme among all the boughs and high treetops, wrapping all the grove in fire, and belching skyward black clouds of thick pitchy darkness; most of all, if a tempest from above has swooped down upon the woods, and a favouring wind masses the flames. When this befalls, the trees are without virtue in their stock, and when cut down cannot revive or from the earth’s depths resume their olden bloom: the luckless oleaster with bitter leaves alone survives. And let no counselor seem so wise as to persuade you to stir the stiff soil when the North Wind blows. Then winter grips the land with frost, and when the plant is set suffers it not to fasten its frozen root in the earth. The best planting season for vines is when in blushing spring the white bird, the foe of long snakes, is come, or close on autumn’s first cold, while the hot sun does not as yet touch winter with his car, and summer now is waning. Spring it is that clothes the glades and forests with leaves, in spring the soil swells and carves the vital seed. Then does Heaven, sovereign father, descend in fruitful showers into the womb of his joyful consort and, mightily mingling with her mighty frame, gives life to every embryo within. Then secluded thickets echo with melodious birdsong and at the trysting hour the herds renew their loves; the bounteous earth prepares to give birth, and the meadows ungirdle to the Zephyr’s balmy breeze; the tender moisture avails for all. The grass safely dares to face the nascent suns, nor does the vine tendril fear the South Wind’s rising or showers launched from the skies by the blustering North, but puts forth buds and unfurls its every leaf. Such days as these, I can imagine well, shone at the dawn of the infant world and took no different course: springtime it was, the whole wide world was keeping spring, and the east winds spared their icy blasts: then the first cattle drank in the light, the earthborn race of men reared its head from the stony plains, and the woods were stocked with game, the firmament with stars. Nor could the tender beings endure the world’s harshness, did not between the seasons’ cold and heat come such repose, and earth receive the blessing of a clement sky. Furthermore, whatever cuttings you plant in your fields, sprinkle them with rich dung, and forget not to cover them with deep soil; or bury with them porous stone or rough shells; for the water will glide between, the air’s searching breath will steal in, and the plants sown will take heart. And, ere now, some have been known to overly them with stones and jars of heavy weight, thus shielding them against pelting showers, and against the time when the sultry Dog Star splits the fields that gape with thirst. When the sets are planted, it remains for you to break up the soil oft-times at the roots, and to swing the ponderous hoe, or to ply the soil under the share’s pressure and turn your toiling bullocks even between your vineyard rows; then to shape smooth canes, shafts of peeled rods, ashen stakes and stout forks, by whose aid the vines may learn to mount, scorn the wind, and run from tier to tier amid the elm tops. And when their early youth has fresh leaves budding, you must spare their weakness, and while the shoot, speeding through the void with loosened reins, pushes joyously skyward, you must not yet attack the plants themselves with the knife’s edge, but with bent fingers pluck the leaves and pick them here and there. Later, when they have shot up and their stout stems have now clasped the elms, then strip their locks and clip their arms – before they shrink from the knife – then at last set up an iron sway and check the flowing branches. You must also weave hedges, and keep out all cattle, chiefly while the leafage is tender and knows naught of trials, for besides unfeeling winters and the sun’s tyranny, ever do wild buffaloes and pestering roes make sport of it; sheep and greedy heifers feed upon it. No cold, stiff with hoar frost, no summer heat, brooding heavily over parched crags, has done it such harm as the flocks and the venom of their sharp tooth, and the scar impressed on the deep-gnawed stem. For no other crime is it that a goat is lain to Bacchus at every altar, and the olden plays enter on the stage; for this the sons of Theseus set up prizes for wit in their villages and at the crossways, and gaily danced in the soft meadows on oiled goatskins. Even so Ausonia’s swains, a race sent from Troy, disport with rude verses and laughter unrestrained, and put on hideous masks of hollow cork, and call on you, Bacchus, in joyous songs, and to you hang waving amulets from the tall pine. Hence every vineyard ripens in generous increase; fullness comes to hollow valleys and deep glades, and every spot towards which the god has turned his comely face. Duly, then, in our country’s songs we will chant for Bacchus the praise he claims, bringing him cakes and dishes; the doomed he-goat, led by the horn, shall stand at the altar, and the rich flesh we will roast on spits of hazel. There is, too, this other task of dressing the vines whereon never is enough care taken; for thrice or four times each year must all your soil be split open, and the clods broken unceasingly with hoe reversed, and all the grove lightened of its foliage. The farmer’s toil returns, moving in a circle, as the year rolls back upon itself over its own footsteps. And already, whenever the vineyard has shed her autumn leafage, and the North Wind has shaken their glory from the woods – already then the keen farmer extends his care to the coming year, and pursues the vine he had left, lopping it with Saturn’s crooked knife and pruning it into shape. Be the first to dig the ground, first to bear away and fire the prunings, first to carry the poles under cover: be the last to reap. Twice the shade thickens on the vines; twice weeds cover the vineyard with thronging briars. Heavy is either toil: “Give praise to large estates, farm a small one.” Further, rough shoots of broom must be cut amid the woods, and river rushes on the banks, and the care of the wild willow bed keeps you at work. Now the vines are bound, now the vineyard lays by the pruning knife, now the last vine dresser sings of his finished rows: still you have to worry the soil and stir the dust, and fear Jove’s rains for your now ripened grapes. Olives, on the other hand, need no tending; they look not for the crooked knife or gripping mattock, when once they have laid hold of the fields and braved the breeze. Earth of herself, when opened with the hoe’s curved fang, yields moisture enough for the plants, and teeming fruits, when opened by the plough. After this mode nurture the plump olive, favoured of Peace. Fruit trees, too, so soon as they feel their stems firm, and come to their strength, swiftly push forth skyward with inborn force, needing no help from us. No less, meanwhile, does every wood grow heavy with fruit, and the birds’ wild haunts blush with crimson berries. Cattle browse on the cytisus, the high wood yields pine brands, the fires of night are fed and pour forth light. And can men be slow to plan and bestow care? Why need I pursue greater themes? The willows and lowly broom – they either yield leafage for he sheep or shade for the shepherd, a fence for the crops and food for honey. And what joy it is to gaze on Cytorus waving with boxwood, and on groves of Narycian pitch! What joy to view fields that owe no dept to the harrow, none to the care of man! Even the barren woods on Caucasian peaks, which angry eastern gales ever toss and tear, yield products, each after its kind, yield useful timber, pines for ships, cedars and cypresses for houses. From these the farmers turn spokes for wheels, or drums for their wains; from these they lay broad keels for boats. The willow’s wealth is in its osiers, the elm’s in its leaves, but the myrtle and cornel, that weapon of war, abound in stout spear shafts; yews are bent into Ituraean bows. So, too, smooth lindens and the box, polished by the lathe, take shape and are hollowed by the sharp steel. So, too, the light alder, launched upon the Po, swims the raging stream; so, too, the bees hive their swarms in the hollow cork-trees, and the heart of a rotting ilex. What boon of equal note have the gifts of Bacchus yielded? Bacchus has even given occasion for offence. It was he who quelled in death the maddened Centaurs, Rhoetus, and Pholus, and Hylaeus, as he aimed his massive flagon at the Lapiths. O farmers, happy beyond measure, could they but know their blessings! For them, far from the clash of arms, most righteous Earth, unbidden, pours forth from her soil an easy sustenance. If no stately mansion with proud portals disgorges from its halls at dawn a flood of those who have come to greet its lord, if they never gaze at doors inlaid with lovely tortoiseshell or at draperies tricked with gold or at bronzes of Ephyra, if their wool’s whiteness is not stained with Assyrian dyes or the service of their clear oil is not spoiled with cassia: yet they have sleep free from anxiety, a life that is innocent of guile and rich with untold treasures. The peace of broad domains, caverns, and natural lakes, and cool vales, the lowing of oxen, and soft slumbers beneath the trees – all are theirs. They have woodland glades and the haunts of game; a youth hardened to toil and inured to scanty fare; worship of gods and reverence for age; among them, as she departed from the earth, Justice left the last imprint of her feet. But as for me – first may the Muses, sweet beyond compare, whose holy emblems, under the spell of mighty love, I bear, take me to themselves, and show me heaven’s pathways, the stars, the sun’s many eclipses, the moon’s many labours; whence come tremblings of the earth, the force to make deep seas swell and burst their barriers, then sink back upon themselves; why winter suns hasten so fast to dip in Ocean, or what delays clog the laggard nights. But if the chill blood about my heart bar me from reaching those realms of nature, let my delight be the country, and the running streams amid the dells – may I love the waters and the woods, though I be unknown to fame. O for those plains, and Spercheus, and Taygetus, where Spartan girls hold Bacchic rites! O for one to set me in the cool glens of Haemus, and shield me under the branches’ giant shade! Blessed is he who has succeeded in learning the laws of nature’s working, has cast beneath his feet all fear and fate’s implacable decree, and the howl of insatiable Death. But happy, too, is he who knows the rural gods, Pan and aged Silvanus and the sisterhood of the Nymphs. Him no honours the people give can move, no purple worn by despots, no strife which leads brother to betray brother; untroubled is he by Dacian incursion swooping down from a Danube leagued in war, untroubled by Rome’s policies spelling doom to kingdoms; if he has not felt pity for the poor, he has never envied the rich. He plucks the fruits which his boughs, which his willing fields, have freely borne; nor has he beheld the iron rigours of the law, the Forum’s madness, or the public archives. Other brave with oars seas unknown, dash upon the sword, or press their way into courts and the chambers of kings. One wreaks ruin on a city and its wretched homes, and all to drink from a jeweled cup and sleep on Tyrian purple; another hoards wealth and gloats over buried gold; one stares in admiration at the rostra; another, open-mouthed, is carried away by the applause of high and low which rolls again and again along the benches. They steep themselves in their brothers’ blood and glory in it; they barter their sweet homes and hearths for exile and seek a country that lies beneath an alien sun. Meanwhile the husbandman has been cleaving the soil with crooked plough; hence comes his year’s work, hence comes sustenance for his country and his little grandsons, hence for his herds of cows and faithful bullocks. No respite is there, but the season teems either with fruits, or with increase of the herds, or with the sheaves of Ceres’ corn, loading the furrows with its yield and bursting the barns. Winter is come; Sicyon’s berry is bruised in the mill, the swine come home gladdened with acorns, the forest yield arbutes, or autumn sheds its varied produce, and high on the sunny rocks basks the mellow vintage. Meanwhile his dear children hang upon his kisses; his unstained home guards its purity; the cows droop milk-laden udders, and on the glad sward, horn to horn, the fat kids wrestle. The master himself keeps holiday, and stretched on the grass, with a fire in the midsts and his comrades wreathing the bowl, offers libation and calls upon you, god of the wine press, and for the keepers of the flock sets up a mark on an elm for the contest of the winged javelin, or they bare their hardy limbs for the rustic wrestling bout. Such a life the old Sabines once lived, such Remus and his brother. Thus, surely, Etruria waxed strong; and Rome has thus become the fairest thing on earth, and with a single city’s wall enclosed her seven hills. Nay, before the Cretan king [Jove] held scepter, and before a godless race banqueted on slaughtered bullocks, such was the life golden Saturn lived on earth, while yet none had heard the clarion blare, none the sword blades ring, as they were laid on the stubborn anvil. But in our course we have traversed a mighty plain, and now it is time to unyoke the necks of our smoking steeds.